ROCHESTER, N.Y. – Semrock announces the addition of a new value-based line of optical edge filters for Raman spectroscopy and fluorescence imaging, thus significantly expanding its industry-leading product offerings. The new EdgeBasic long-wave-pass filters are hard-coated optical filters that share all the high transmission (98% typical) and laser-line blocking (optical density > 6) performance of Semrock's popular ultrasteep RazorEdge® filters, but with edge steepness that is tailored for cost-sensitive "application-specific" Raman systems that do not require measurement of the smallest possible Raman shifts, as well as for sensitive fluorescence imaging systems that demand maximum signal capture. 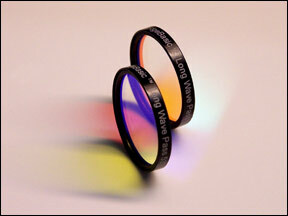 Like all of Semrock's thin-film optical filters, the new EdgeBasic filters are hard-coated using Semrock's ion-beam sputtering deposition process for permanent "no burn-out" optical durability and lasting reliability even in harsh environmental conditions, and are backed by an industry-leading five year warranty. These new filters also have extended blocking of light from the laser wavelength deep into the ultraviolet to enhance their suitability for fluorescence applications. "Semrock has long been known for providing quality optical filters for cutting-edge applications like Raman spectroscopy," said Dr. Victor Mizrahi, President & CEO of Semrock. "We are now in a position to leverage our years of development to apply our sophisticated filter manufacturing technology to the more cost-conscious market for standard and high-volume applications. The introduction of these new EdgeBasic filters, following closely on the heels of our new value-priced BrightLine Basic fluorescence sets, demonstrates Semrock's ongoing commitment to bring superior products to the broad middle market. This level of performance and reliability was previously unheard of at these prices." BrightLine, RazorEdge and Semrock are registered trademarks, and EdgeBasic and BrightLine Basic are trademarks of Semrock, Inc.